An epic true story of love and betrayal, Summer in February arrives on DVD August 12 from Cinedigm and Tribeca Film. 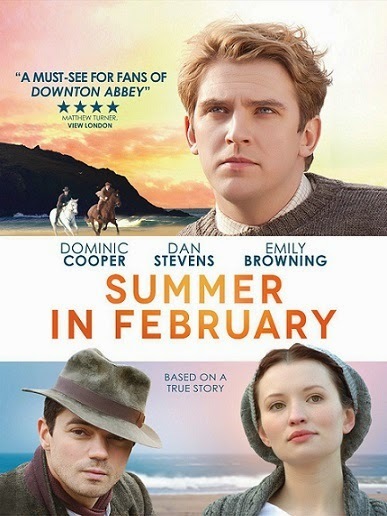 Featuring Dominic Cooper (Captain America), Screen Actors Guild Award winner Dan Stevens (“Downton Abbey”) and Emily Browning (Pompeii, Sucker Punch), Summer in February follows the early life and love of 20th century equestrian painter Sir Alfred Munning before his rise to acclaim. Adapted from the book by Jonathan Smith, Summer in February is set in an idyllic artist colony in England, 1913, as the world stands on the brink of war. When fledgling artist Munning (Cooper) and his best friend Gilbert (Stevens) meet the beautiful Florence Carter-Wood (Browning), romance soon blossoms between Munning and Carter-Wood. However, Gilbert finds that he is falling in love with her as well. As the country is brought to its knees with the start of the World War I, the deeply moving film follows the heartbreaking love triangle that ensues to its tragic result. An epic true story of love and betrayal, Summer in February arrives on DVD August 12 from Cinedigm (NASDAQ: CIDM) and Tribeca Film. Featuring Dominic Cooper (Captain America), Screen Actors Guild Award® winner Dan Stevens (“Downton Abbey”) and Emily Browning (Pompeii, Sucker Punch), Summer in February follows the early life and love of 20th century equestrian painter Sir Alfred Munning before his rise to acclaim. Adapted from the book by Jonathan Smith, Summer in February is set in an idyllic artist colony in England, 1913, as the world stands on the brink of war. When fledgling artist Munning (Cooper) and his best friend Gilbert (Stevens) meet the beautiful Florence Carter-Wood (Browning), romance soon blossoms between Munning and Carter-Wood. However, Gilbert finds that he is falling in love with her as well. As the country is brought to its knees with the start of the World War I, the deeply moving film follows the heartbreaking love triangle that ensues to its tragic result. 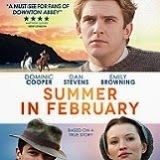 The Summer in February DVD also features an interview with star Dan Stevens. SynopsisA sweeping romance set at a bohemian artist colony on the picturesque coast of pre-war England, Summer in February is based on the true story of painter Sir Alfred Munnings (Cooper) and his blue-blood best friend Gilbert (Stevens). Munnings rises to become one of the premier artists of his time, winning the affection of beauty Florence Carter-Wood (Browning). But when Gilbert falls for Florence as well, a love triangle emerges with tragic consequences.